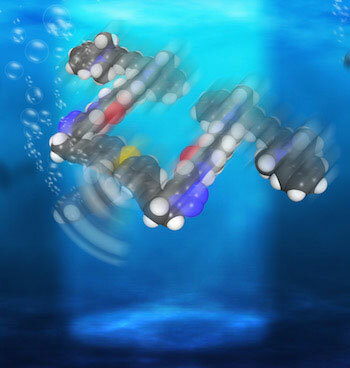 (Nanowerk News) Though they’re not quite ready for boarding a lá “Fantastic Voyage,” nanoscale submarines created at Rice University are proving themselves seaworthy. Each of the single-molecule, 244-atom submersibles built in the Rice lab of chemist James Tour has a motor powered by ultraviolet light. With each full revolution, the motor’s tail-like propeller moves the sub forward 18 nanometers. And with the motors running at more than a million RPM, that translates into speed. Though the sub’s top speed amounts to less than 1 inch per second, Tour said that’s a breakneck pace on the molecular scale. Expressed in a different way, the researchers reported this month in the American Chemical Society journal Nano Letters ("Unimolecular Submersible Nanomachines. Synthesis, Actuation, and Monitoring") that their light-driven nanosubmersibles show an “enhancement in diffusion” of 26 percent. That means the subs diffuse, or spread out, much faster than they already do due to Brownian motion, the random way particles spread in a solution. While they can’t be steered yet, the study proves molecular motors are powerful enough to drive the sub-10-nanometer subs through solutions of moving molecules of about the same size. “This is akin to a person walking across a basketball court with 1,000 people throwing basketballs at him,” Tour said. Tour’s group has extensive experience with molecular machines. A decade ago, his lab introduced the world to nanocars, single-molecule cars with four wheels, axles and independent suspensions that could be “driven” across a surface. Tour said many scientists have created microscopic machines with motors over the years, but most have either used or generated toxic chemicals. He said a motor that was conceived in the last decade by a group in the Netherlands proved suitable for Rice’s submersibles, which were produced in a 20-step chemical synthesis. “One of the challenges was arming the motors with the appropriate fluorophores for tracking without altering the fast rotation,” García-López said. Once built, the team turned to Gufeng Wang at North Carolina State University to measure how well the nanosubs moved. The North Carolina team sandwiched a drop of diluted acetonitrile liquid containing a few nanosubs between two slides and used a custom confocal fluorescence microscope to hit it from opposite sides with both ultraviolet light (for the motor) and a red laser (for the pontoons). The microscope’s laser defined a column of light in the solution within which tracking occurred, García-López said. “That way, the NC State team could guarantee it was analyzing only one molecule at a time,” he said. Co-authors of the paper are Rice alumnus Pinn-Tsong Chiang and postdoctoral researcher Gedeng Ruan; North Carolina State graduate student Fang Chen; Angel Martí, an associate professor of chemistry, of bioengineering and of materials science and nanoengineering, and Anatoly Kolomeisky, a professor of chemistry and of chemical and biomolecular engineering, both at Rice. Wang is an assistant professor of analytical chemistry at North Carolina State. Tour is the T.T. and W.F. Chao Chair in Chemistry as well as a professor of computer science and of materials science and nanoengineering.